According to the "Index to the Plates" (8.xvi), Ruskin discusses this plate on the pages quoted below. 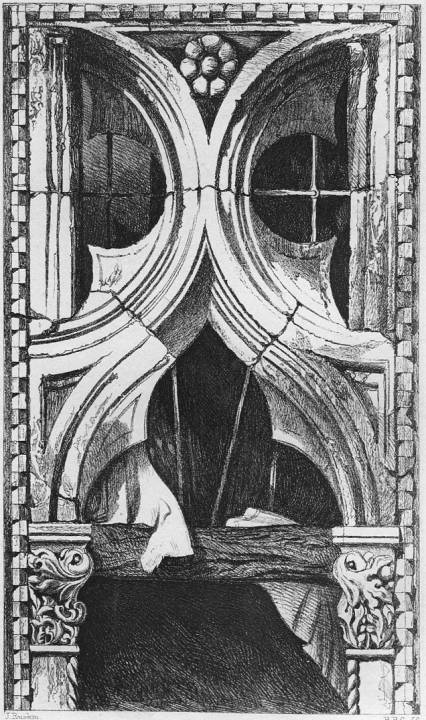 [In a note on p.131 Ruskin adds,] The plate represents one of the lateral windows of the third storey of the Palazzo Foscari. It was drawn from the opposite side of the Grand Canal, and the lines of its traceries are therefore given as they appear in somewhat distant effect. It shows only segments of the characteristic quatrefoils of the central windows. I found by measurement their construction exceedingly simple. Four circles are drawn in contact within the large circle. Two tangential lines are then drawn to each opposite pair, enclosing the four circles in a hollow cross. An inner circle struck through the intersections of the circles by the tangents, truncates the cusps. Ruskin, John. Works, "The Library Edition." eds. E. T. Cook and Alexander Wedderburn. 39 vols. London: George Allen, 1903-1912. Ruskin, John. The Seven Lamps of Architecture in Works, vol. 8. Hathi Trust Digital Library. Web. 6 June 2010.